HazCom labels can be purchased in a variety of materials, styles and sizes. Some styles include NFPA Self-Laminating, NFPA Hazard, Super-Sticky HazCom, HMIG, Chemical Hazard Warning, HazWaste Container, Drum Identification, and Biohazard Labels. 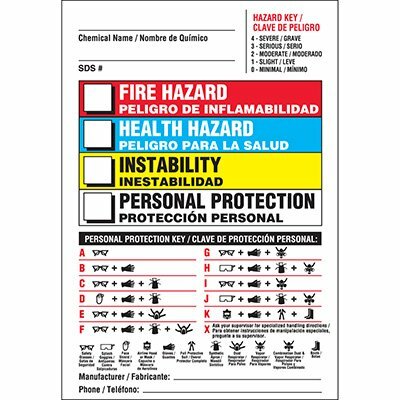 Collectively, these Hazmat Labels help ensure the safety of individuals handling hazardous materials. Flammable Storage Labels are attached to chemicals, cabinets, equipment, etc., within your manufacturing area, facility or storage areas. Labels give workers a clear idea of the type and danger level of the chemicals, gases and other dangerous substance which they are handling or exposed to daily. Labels come in a variety of styles and for various situations. Choose from the following: HMIG Chemical Hazard Labels, Biohazard Labels, NFPA Diamond- PPE/ORG, Drum Identification Labels, Right-To-Know Labels and many more.